Everything for the Water to the Woods! 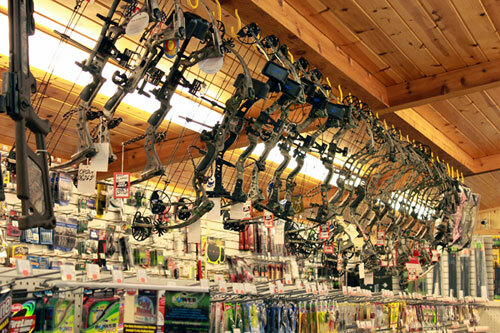 BowTech took the archery industry by storm starting in 1999 with manufacturing in Eugene, Oregon. With their motto being “Refuse To Follow,” they have built a brand based on being the leader of technology and it is proven when you fire a BowTech bow. A few BowTech bows we carry include the Destroyer 340 and 350, Admiral FLX and Octane accessories. Diamond Bows are also sold in our store. Today, Horton Manufacturing is the world leader in high-performance hunting crossbows, still blending the latest technology with the needs of the modern hunter. Steeped in tradition and performance, Horton proudly makes the finest crossbows on the planet. We also sell Ten Point crossbows. Whatever bow you have our bow techs will adjust each bow for a perfect fit and bows can be tested in our archery lane. © 2019 Log Cabin Store | "Everything for the Water to the Woods!"